Section Menu...Our Experts Listings • Our Experts - Alan S. Davis, M.D. • Our Experts - Annie Soriano, M.D. • Our Experts - Asha M. Thomas, M.D. • Our Experts - Berrin Ergun-Longmire, M.D. • Our Experts - Brian A. Janz, M.D. • Our Experts - Brian L. Bello, M.D. • Our Experts - Charles A. Hartjen, M.D. • Our Experts - Christina Li, M.D., FACS • Dale B. Johnson, M.D. • Donald Abrams, M.D. • Our Experts - Edward T. Soriano, D.O. • Gia M. Bradley, M.D. • Ira M. Garonzik, M.D. • Our Experts - James L. Frazier III, M.D. • Our Experts - James Nace, D.O., M.P.T., F.A.O.A.O. • Our Experts - Jason M. Fixler, M.D. • Our Experts - Jeanette A. Linder, M.D. • Our Experts - John E. Herzenberg, M.D. • Our Experts - Lisa Gerberg, R.N. • Our Experts - Martin Engelhardt, M.D. • Our Experts - Mayer Gorbaty, M.D. • Our Experts - Melanie C. Brown, M.D. • Our Experts - Michelle Briggs, PMHNP-BC • Our Experts - Noman A. Siddiqui, D.P.M. • Our Experts - Oscar M. Taube, M.D. • Our Experts - Paresh M. Shah, M.D. • Our Experts - Parvathy A. Pillai, M.D. • Pedro P. Arrabal, M.D. • Our Experts - Peter Andrews, PA-C • Our Experts - Robert M. Saltzman, M.D. • Our Experts - Ronald Delanois, M.D. • Our Experts - Sally M. Pinkstaff, M.D. • Our Experts - Shawn C. Standard, M.D. • Our Experts - Susan M. Levy, M.D. • Our Experts - Terrie O. Dashiell, M.S., RN, CCP • Our Experts - W. Peter Geis, M.D. • Mark R. Katlic, M.D. • Our Experts • Laura K. Green, M.D. 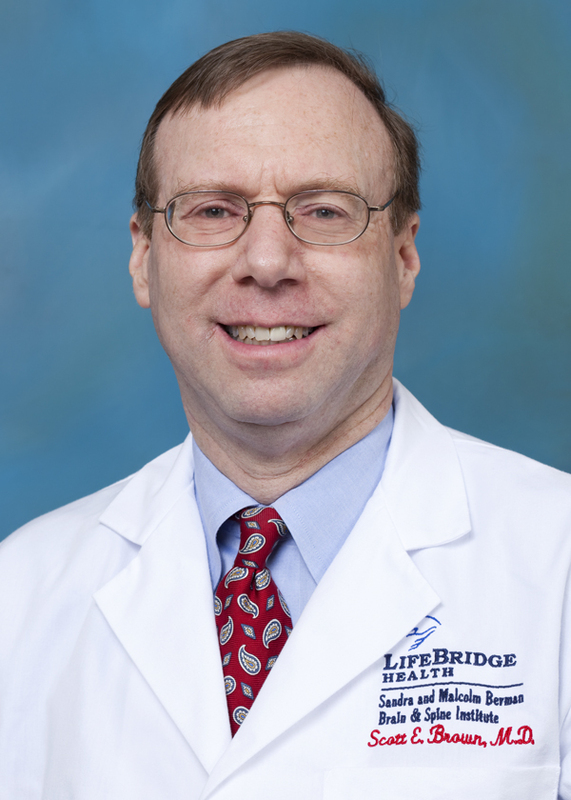 LifeBridge Health > Press Room > Our Experts Listings > Scott E. Brown, M.D. Our Experts - Scott E. Brown, M.D. 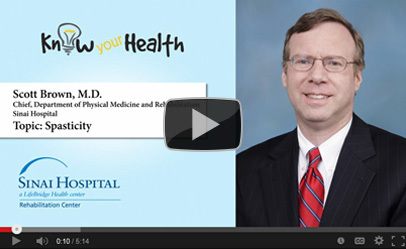 Scott Brown, M.D., is the chief of the department of Physical Medicine and Rehabilitation at Sinai Hospital. He is a physiatrist, a doctor who specializes in physical medicine and rehab. He focuses on managing disabilities as well as treating injuries and diseases. A frequent speaker on rehabilitation issues, Dr. Brown has written for many publications about performing arts medicine, rehabilitation and workers’ compensation. In this WBAL-AM "Know Your Health" radio clip, Dr. Brown discusses spasticity. To arrange an interview with Dr. Brown, please call 410-601-2296 or send an email.